Because Walter Braunfels (1882-1954) was half-Jewish, he was dismissed from his position as director of the Academy of Music in Cologne in 1933 and performance of his music thereafter was forbidden. It didn't matter to the Nazis that Braunfels was a practicing Roman Catholic, only that half his blood was tainted by what they considered the most degenerate of non-Aryan races. They had at least one further reason to hate the composer: he had refused to write an anthem a decade earlier for their burgeoning political movement. And, too, Hitler and the Nazis were wrapped up in adulation for their musical hero from the past, the strongly anti-Semitic Richard Wagner, the perfect composer to fill their dubious bill. Secretly, though, they must have feared Braunfels might come to challenge their idol with his "entartete musik" (degenerate music). If this opera is typical of Braunfels' work, I'd say their fears may have been well founded. In the rubble that followed World War II, Braunfels, who had courageously remained in Germany, somehow managing to avoid extermination, reestablished the Cologne Academy of Music and resurrected his career as a concert pianist. But by then, he was a mostly forgotten composer, whose music was seen as rather old-fashioned by the younger generation. Until recently Braunfels has remained in almost complete obscurity, but, hopefully, this new London recording will change that. The Birds, first performed in 1920, is based on the Aristophanes' comedy of the same name. It is the story of two men, Good Hope and Loyal Friend, the first lamenting his mistreatment by women, the latter fleeing the decadence of art, who together find their fantasy world, the realm of the birds. They urge the birds to construct a fortress that will enable them to impose a heavy tax on the gods by controlling smoke from sacrifices by men which the gods need for nourishment. The birds comply and incur the wrath of Zeus, and their fortress is destroyed in a violent storm. The two men depart for civilization, but Good Hope, having earlier been kissed by the beguiling Nightingale, ponders that the brief intimacy has forever changed him. Not exactly your normal operatic plot, but the story is lively and quite witty, and a bit more involved than this capsule description, of course. 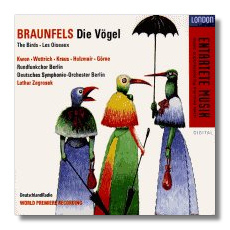 Braunfels' music clearly shows the influence of Wagner (what German composer writing opera at that time didn't, though?) and Strauss. But from these elements Braunfels forged his own distinctive, eminently approachable style that becomes quite recognizable upon repeated hearings. Zagrosek's reading and the performances by his cast and orchestra are gripping and more than do justice to this wonderful score. Wottrich and Kraus are impressive in the male leads. Try the former's powerful rendering of the closing number, So ist dies alles denn gewesen, wie? (CD 2, track 12) to sample his transcendent talent. Hellen Kwon is positively angelic as Nightingale, as immediately evidenced by her opening number, Liebwerte Freunde (CD 1, track 2). Marita Posselt (Wren) is just as moving (her voice is sweet and absolutely lovely), and the rest of the cast rises splendidly to the challenging occasion. London offers excellent sound and very intelligent notes. If you're interested in opera, especially in the works of Wagner and Strauss, you'll likely find this new issue quite enjoyable and fully worth the asking price.